SURF type pylon - price 49.98 lev without VAT. SURF type pylon is removable, durable, lightweight, packed in a bag and made of aluminum. 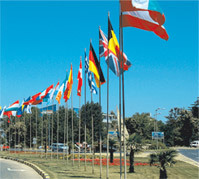 SURF type flag of wind tight fabric and full-color digital printing - price 69.98 lev without VAT.